Latham made 176 following his 264 in the first Test at Wellington; Nicholls made an unbeaten 162, his highest Test score and De Grandhomme dashed the fastest 50 by a New Zealander in Tests. Latham made 176 following his 264 in the first Test at Wellington; Nicholls made an unbeaten 162, his highest Test score and De Grandhomme dashed the fastest 50 by a New Zealander in Tests, finishing 71 not out when the declaration came. After toiling in the field for 153 overs, Sri Lanka's batsmen were forced to pad up and try to survive the last hour of the day to keep alive the tourists' faint hopes of saving the two-match series. Those odds became longer when Dimuth Karunaratne (0) fell in the first over of the innings and Danushka Gunathilaka (4) five balls later. Captain Dinesh Chandimal joined with rising star Kusal Mendis to guide Sri Lanka to stumps without further loss, but two full days stretch ahead. At stumps, Sri Lanka was 26-2 with Chandimal 14 not out and Mendis 6. In Sri Lanka's favor, it still has in hand Angelo Mathes, its best batsman in this series with scores of 83, 121 not out and 33 not out. Mathews put on an unbroken 274 with Mendis to save the first Test which was drawn. 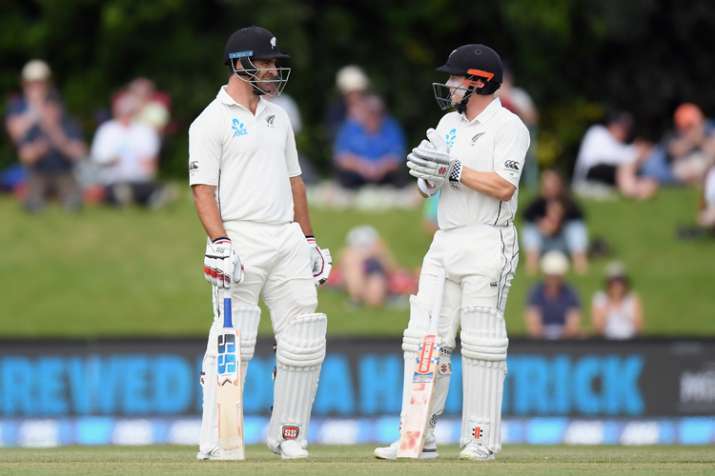 But New Zealand will go into the fourth day in a position of overwhelming strength, thanks to Latham and Nicholls, who put on 214 for the fourth wicket and scored similar centuries on their shared home ground at Hagley Park. Latham achieved his eighth Test century and in his second in consecutive Tests while Nicholls made his fourth and his highest score, beating his previous best of 145. De Grandhomme came in when Latham was out, caught down the leg side by wicketkeeper Niroshan Dickwella from the last ball before tea, and blasted a half century from 28 balls, beating the record of his current teammate Tim Southee (29 balls) for the fastest Test 50 by a New Zealander. He hastened the declaration which came at 5.05 p.m. and asked Sri Lanka to score an improbable 660 to win the match. Australia's successful chase for 418 against the West Indies in 2003 remains the best in Test history. Sri Lanka would also have to score the second-highest fourth-innings total in Tests to win the match and series. "In this game of cricket I guess you have more disappointing days than successful ones so it's nice to enjoy the good days," Latham said. "The biggest thing for me coming into this Test match was to try and park what happened in Wellington and start again." Latham personally ensured New Zealand's control of the match as he built its second innings in partnerships of 121 for the first wicket with Jeet Raval (74), 68 for the second with Kane Williamson (48) and 58 for the third with Taylor. Latham reached his century from 267 balls as his father Rod, also a New Zealand opening batsman looked on. Nicholls reached his from 171 balls, saluted by family and friends.